Heights of Madness (published by Metro Books in 2009) was my first book (also available as an ebook), written following a three-month journey between the highest points in the UK’s 92 historic counties in 2006. My second book, Isles at the Edge of the Sea, was published in 2011. The book is a travelogue following a land and sea journey around the west coast islands of Scotland, starting from Arran and culminating on St Kilda. A Cicerone guidebook, The UK’s County Tops: Reaching the Top of 91 Historic Counties, providing detailed route information, maps and photographs, about the places I visited for Heights of Madness, was published in 2011. 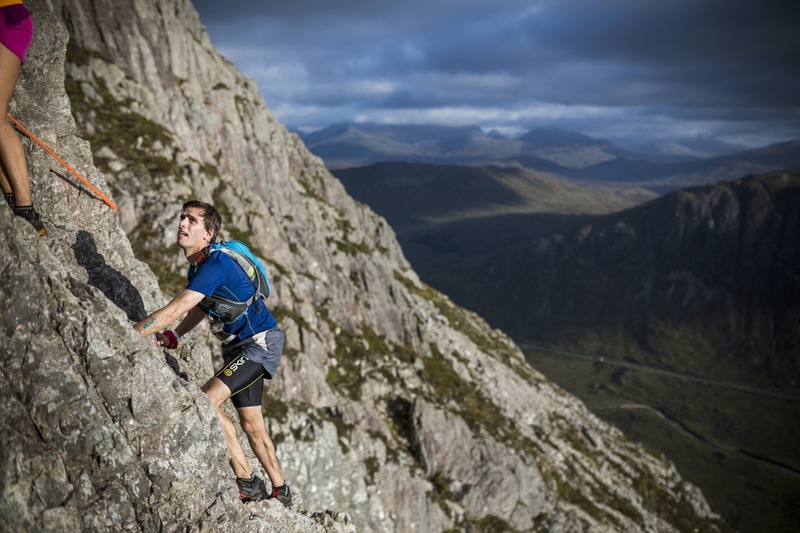 My latest book, The Mountains Are Calling: running in the high places of Scotland, will be published in May 2018. Enjoyed your book immensely, well written and interesting. But, as an older person, I’m worried that you don’t seem to eat properly. Perhaps you did not mention the five star gourmet dinners you had along the way? Have you improved your diet since? Yvonne, thanks for your comments about the book – always nice to hear. If there were five-star gourmet dinners along the route I would have mentioned them! My diet has, mercifully, improved since. I am in the middle of reading your book at the moment and a I cant put it down.Your descriptions of your feelings and emotions are very well put.I havent enjoyed a travel book so much since Bill Brysons A small Island. A book that makes me laugh out loud has to be an excellent one. I live within site of the Carneddau mountains in Snowdonia in a small quarry town called Bethesda which you will have passed through on the way to Anglesey on the A5 so I particularly enjoyed your comments about North Wales a place where I carry out most of my adventures. I am looking forward to your next book and sharing more hilarious experiences with you. I have just finished your ‘Heights of Madness’ book which was extremely enjoyable from cover to cover. Just a small but important observation – in the book you state that the highest summit in Moray was one of the Cromdale Hills. Wrong! Ben Rinnes near Aberlour is the highest at 840m. Will you have to redo the whole round again! Thank you for the message; I’m delighted you enjoyed the book. Ben Rinnes had caused me some initial confusion – however, the mountain lies within historic Banffshire, not Morayshire. It’s a shame as Ben Rinnes would be a worthy county top. Still, it gives a more obscure hill a little glamour. There’s now a guidebook on the historic county tops, The UK’s County Tops, published by Cicerone, available, in case you’re interested. Ah Jonny you’ve put me in a quandry!! I’m working in Angola for a few years, post is difficult and very expensive. But I’d ordered your ‘Heights of Madness’ book after just reading a summary on Stanford’s website, and it’s just got DHLed here with other books. I started the Introduction to get a ‘taster’ but cos I love maps, and need to see where all the peaks are & how you did the journey, I thought I’d go online, thinking of google maps, or OS maps. But what else do I find? Only the recently published separate ‘UK county Tops’ with all the necessary!!! But I won’t be able to see it till I return to UK mid-December. So do I wait 2+ months to get a full appreciation of your amazing idea, or just get stuck in, and probably read it in one go, whilst checking online maps? Well I’m just about to order the map book (and the Isles at the Edge of the Sea, I’m sure that’s going to be fab) and have loads of other books sent over to tide me over, so I’m gonna lock your 1st book away, and see if I can last the necessary time! Aaargh. Mike, I hope you’ve sorted out your conundrum. I reckon you’ve made a good decision. A few peole have told me that they read Heights with a map in the other hand. The UK’s County Tops should, therefore, be the perfect companion. Besides, December will come round before we know it. Eventually I’ve managed to read your excellent Heights of Madness & Isles at the Edge of the Sea books! Also got the ‘UK County Tops’ guide which is great for the individual top route details. But I took my time getting back to you because I was creating an overall UK map showing your route, each top and even overnight stops. (I was gonna attach, but can’t. Is there anywhere I can send it for you to see, though you probably have one already?) Anyway with the map I was really able to appreciate exactly what you achieved. And the latter is just astonishing. Never mind 92 days, it was really only 77. A great idea to finish in Scotland as well. When you get the weather (but indeed not the midges!) it really is a magnificent place to visit. As was also clear from your Isles book. Gutted for you though that you lost your camera near the end. And that your radio career was so short-lived! You have an excellent writing style Jonny. Provide plenty of details relevant to your journeys, other interesting facts and come up with plenty of funny bits. I particularly liked the references to Scottish penguins, Ben Lomond as Keira Knightley, B &B in Moscow instead of Market Bosworth, secret pact between dogs and motorists, and a turmoil of dolphins ordering a fish supper!! And for some reason when you were describing your bizarre hallucination the image of the pterodactyl actually pausing before it ripped your ear of just cracked me up!! But certainly your books run the full gauntlet of human emotions that arise from such adventures. And even though there were only to be expected occasional low moments, I can fully appreciate your overall satisfaction, pride and desire for more that, to quote you “consumes my fantasies”. I’ve been to many of the Scottish Isles and several of the county tops, but you have inspired me to visit places like Colonsay, Coll, Tiree, St Kilda. Anyway, I’ve recommended your books to friends so hopefully they’ll go and buy and add a few pennies to your school salary! And hopefully your schoolkids are getting copies too, although no doubt they are asking for freebies. PS you don’t mention the dog in the photo at Worcestershire Beacon. Joined you for the day?! PPS sorry for sounding like a spoilsport but by creating my map I spotted 6 travel-related errors in the Heights book (it’s a habit from my job, I’m a very good proof-reader!). If you want them known for the next published edition let me know! I’ve been totally engrossed in Isles at the Edge of the Sea, and was reading with trepidation your account of conquering the In Pinn (which I did myself in April this year) when suddenly I was transported back to Eigg! My book goes from page 146, back to page 115 and then on to page 130 before then going to page 163 and Barra….so I’ve missed out on the In Pinn adventure! Is this a common problem or do I have a disfunctional book?? Help! Heather, I’m so sorry about this. I haven’t a clue what has happened. If you complain to the seller, I’m sure they will give you a replacement copy (with all the pages in the right order!) I’ll mention this to my publisher too. Let me know how you get on. Good idea – I’m heading up to Ullapool on Friday and will take it with me to The Ceilidh Place where I bought it, and see what they say. I’ll let you know. I’m assuming you made it safely up and down the In Pinn then? Enjoying the book immensely and looking forward to getting back over to the Isles in 2012! Hi – I’m the compiler and author of “The Hardys – the UK’s High Points”. My list includes admin area high points as well as hill range and island high points. See “www.thehardys.org” (for the book, 3rd Edition et al) and/or the Wikipedia article “Hardy (hill)”. I’m going through your “Historic County Tops” book – excellent, though I have a few comments! Will be in touch if I may (an e-mail address would help, as I can’t attach anything here?). I really enjoyed reading Heights of Madness and Isles at the Edge of the Sea recently – particularly reading about Rum and Jura which along with the Orkneys are my favourite Scottish Islands and St Kilda is on my hit list to get to. I am wondering what adventure you could be up to next with your 6 week School hols? I would recommend turning your adventurous mind towards the wild and dramatic country of Iceland where the scenary and mountains are trully spectacular and different to anywhere in Western Europe. Thanks for your advice and tip about Iceland. That is somewhere I haven’t been and should in due course. I’m back up to Scotland in a couple of days, first to Skye, then I am planning to venture into Knoydart and hopefully run the South Glen Shiel ridge and a wee bit in the Cairngorms. Oh – and thriled that you enjoyed Heights and Isles. I was hoping that you could give me some publishing advice? I have been looking for someone to ask and it feels like fate that I came across your book in the library today. It seems that I am following the exact same course that you have already pursued. I graduated this summer from Exeter having studied History and am now planning on walking the 800 miles around the newly opened ‘Wales Coast Path’ and writing about my experiences as I go. I literally have no idea about publishing, or writing for publishers and any advice on how I can get started would be ideal! If some one desires expert view about running a blog then i ecommend him/her to go tto see this web site, Keep up the good work. Just finished reading Isles at the Edge of the Sea. Absolutely loved it, particularly how relatable it is and overall how genuine the account is. I’m planning on travelling through the west of the U.K. next summer, going from the Breacon Beacons up to Scotland. I will have about 3 days to travel around the islands off the west coast of Scotland – where would you recommend to go within this time frame? I’m also teaching in South East London, so benefit from the long summer holidays to explore. I’m delighted to hear you enjoyed Isles and many thanks for your comments. If time is short and despite my experiences with midges, I’d recommend Rum. You can get a train from Glasgow to Mallaig, then ferry to Rum. The island is wild and remote, and one of the most challenging of the bigger islands. I hope that helps and let me know how your journey progresses.